Crowns Could be the 'Smile' Solution for Some Unattractive Teeth - James E. Eash, D.D.S. While dental implants have become the most popular restoration among both dentists and patients, it’s primarily a tooth replacement — either for a missing tooth or a tooth beyond repair that must be extracted. But what if your tooth is still viable beneath its unattractive exterior? From an oral health standpoint, it’s usually wise to preserve it. Even so, you still have options for making a tooth that’s spoiling your smile more attractive. One of the most effective solutions happens to be one of the oldest in dentistry: a crown. In effect, a crown is a life-like replica made of metal or dental porcelain that’s bonded over a tooth. And with today’s advanced materials and methods a crown can not only enhance the appearance of the tooth it covers, it can also be made to blend with the color and symmetry of adjacent teeth. Here are a few dental situations where a crown could provide both protection for a tooth and a more attractive appearance. Chipped, Damaged or Abnormally Developed Teeth. Teeth often take the brunt of mouth injuries, resulting in chips or even fractures. Also, teeth sometimes don’t erupt fully or develop a normal shape. 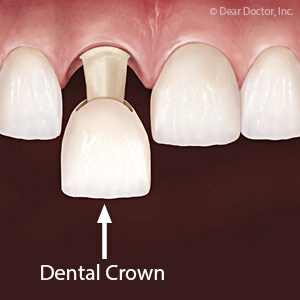 A crown can effectively cover these missing or abnormal parts of a tooth and restore a more natural appearance. Following Root Canal Treatment. Trauma or deep decay can damage the interior of a tooth - the pulp and root canals - and endanger its survival. A root canal treatment cleans out and repairs these areas, filling them with a special filling to prevent further infection. A crown is usually necessary to both protect the tooth and restore its appearance. Discoloration. There’s a difference between outward staining of the enamel, which can usually be brightened with whitening solutions, and staining deep within the tooth from various causes. While there are techniques to bleach “intrinsic” staining, a crown provides another option for covering a heavily discolored tooth for a more attractive appearance. Excessive Wear. We all experience some teeth wearing as we age; but grinding or clenching habits can accelerate that wear and shorten teeth, resulting in a prematurely aged look. Crowns restore worn teeth to a more normal length that can take “years” off your smile.